In trees, heart rot is caused by a fungal disease that causes the center of the trunk and branches to decay. The most obvious symptom is the presence of mushrooms or fungal growths, called conks, on the surface of the trunk or limbs. Most hardwood species can be afflicted with heart rot, and it can be a major problem for the logging and lumber industry since the center heartwood is the most valuable wood in a hardwood tree. Heart rot in living trees can be caused by many different fungal agents and pathogens that can enter the tree through open wounds and exposed inner bark wood to infiltrate the center core of the tree—the heartwood. Heartwood makes up most of a tree's inner wood and support structure, so over time, this rot can cause the tree to fail and collapse. Heartwood cells have some resistance to decay but depend on a barrier of protection from the bark and outside living tissue. Heart rot can occur in many hardwoods and other deciduous species but is especially common in oaks infected with the I. dryophilus and P. everhartii decay fungi. All deciduous trees can get heart rot, while resinous conifers have some extra resistance. It should be noted that heartwood is genetically programmed to spontaneously separate from living wood tissues that surround it. Once heartwood formation has begun to lay down annual layers and increase in volume, the heartwood quickly becomes the largest part of the tree's structure by volume. When that living barrier of protection surrounding the heartwood fails, the resulting disease in the heartwood causes it to soften. It quickly becomes structurally weaker and prone to breakage. 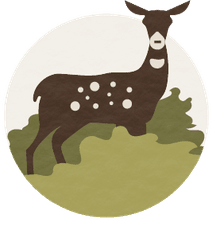 A mature tree that has a large volume of heartwood is more at risk than a young tree, simply because its heartwood constitutes more of its structure. 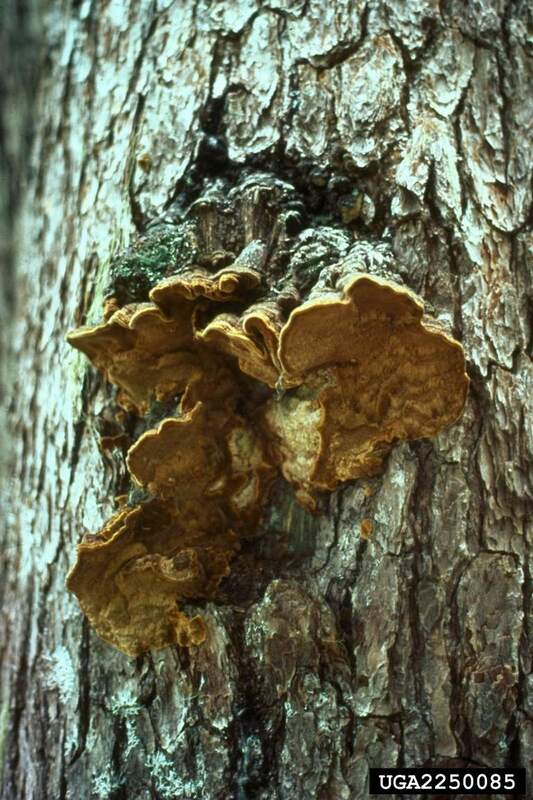 Usually, a "conk" or mushrooming fruiting body on the surface of the tree is the first sign at the site of infection. A useful rule of thumb suggests that a cubic foot of inner heartwood wood has decayed for each conk produced— there is a lot of bad wood behind that mushroom, in other words. Fortunately, though, heart rot fungi do not invade living wood of healthy trees. Other than the resulting structural weakness heart rot creates, a tree can otherwise look quite healthy even though it is riddled with heart rot. Heart rot is a major factor influencing the economics of logging high-value lumber, although it is a natural consequence in many older forests. The heartwood of tree is where the valuable lumber exists, and a badly rotten tree is of no value to the timber industry. A hardwood tree that lives long enough will likely deal with heart rot at some point, since it is a natural part of the tree's life cycle, especially in native forests. A very old tree will almost certainly suffer storm damage at some point that will allow fungi to enter and begin the process of heart rot. In some cases, entire forests may be at risk if, for example, a catastrophic storm has caused major damage at some time in the past. The fungi spread very slowly within a tree, so it may be many years after the initial fungal infection that serious weakness becomes evident. Heart rot is prevalent throughout the world, and it affects all hardwood trees. It can be very hard to prevent and control, although a tree that is carefully monitored over its entire lifetime may avoid it. As long as a tree is growing vigorously, rot will be confined to a small central core within the tree. This behavior is called tree wood compartmentalization. But if the tree is weakened and fresh wood exposed by severe pruning or storm damage, decay fungi can advance into more and more of the tree's heartwood. Minimize pruning wounds that expose large areas of wood. Shape trees at an early age so major branch removal will not be necessary later. Remove broken branch stubs following storm damage. Have trees you suspect of heart rot checked by an arborist to determine if sufficient live wood is present for structural safety. Check trees every few years to be certain new growth is maintaining a sound structure. Large trunks and main branches with extensive decay may have little sound wood to support the tree.